June | 2012 | hair, there and everywhere! Another skin update. Gotta love the skin updates! Well my skin is making good progress since the elimination of Retin A Micro, implementing of chemical peels in routine and use of Tri-Sprintec birth control. However, I keep getting these annoying bumps under my jawline that I could not get rid of. When I would not wear makeup, they would go away, but as soon as I would put makeup (namely, Bare Minerals), they would reappear. I thought that using Bare Minerals was great for my skin, after all, they tout how Bare Minerals is so pure, that you can sleep in it. YEAH RIGHT! After some thinking last week, I realized that I was getting pimples that cropped up during the day when wearing Bare Minerals, so it had to be some ingredient causing this. I looked online and found out that the ingredient bismuth that can be hazardous to sensitive skin like mine. Check out this article. So I decided to wear Clinique, as I have had good results with them in the past. So far, acne under my chin has been greatly reduced! I guess putting slabs of powdered dirt on your face isn’t as healthy as it seems! On another skin note, I am happy to report that I have returned to not wearing makeup on the weekends. I just throw on some tinted Clearasil and moisturizer and go! I took that for granted when my skin was in great condition. I am just thankful that I have made progress thus far! Greetings! Last week I made a decision to try to go without using heat as long as I could. So last Saturday, I did my normal wash day routine complete with pre-poo/hot oil, a black tea rinse, deep conditioning steam treatment and leave-ins. After detangling, I two-strand twisted my hair and let it air dry. I cannot express the amount of joy of not having to roll my hair and sit under the dryer. Flash forward to Thursday evening, my hair was getting a bit parched and thirsty, so I felt it was time for a co-wash. I co-washed with Alberto V-05 and Alterna Caviar. I sprayed Roux 619 all over my hair and instead of detangling my hair AFTER applying leave-ins, I detangled before and I felt that the process went a lot better. 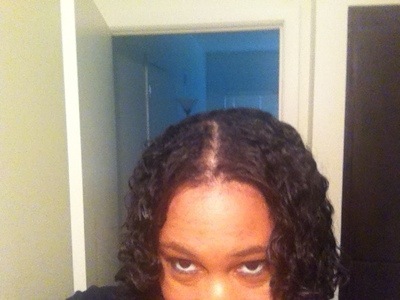 I then began to apply leave-ins to each section, followed by two strand twists. 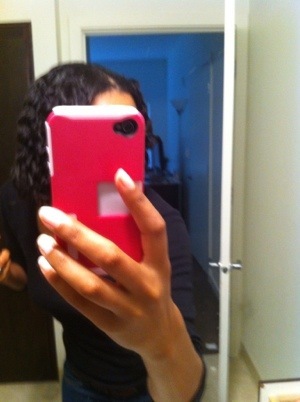 Instead of doing my normal 3 on each side, I did about 5 or 6 twists on each half of my head. I then pin-curled them and tied them with a cotton scarf, because I wanted them to dry faster overnight since I didn’t wash my hair until 8:30pm. The look I was going for was silky-looking twists and when I took them down this morning, that it was I got! I was amazed at how pretty they looked! I have gotten a lot of compliments from my co-workers! It really looks like I have natural hair! My hair is so thick and curly! And even when it is tightly curled, my hair comes down past my shoulders. I cannot wait until I do this style and it is APL unstretched! The curls are pretty all the way down to the end (normally the ends look a bit frazzled). I think this will be the style that I will be doing this summer. 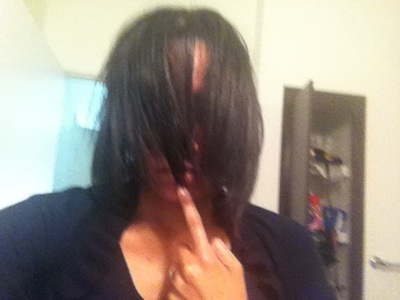 I have about 56 days until my relaxer, so I think that I can continue this no-heat regimen. It will also prevent me from doing moot length checks every week (sigh … those are so tiresome). I probably will co-wash my hair 1 or 2x per week and shampoo as normal on the weekends. 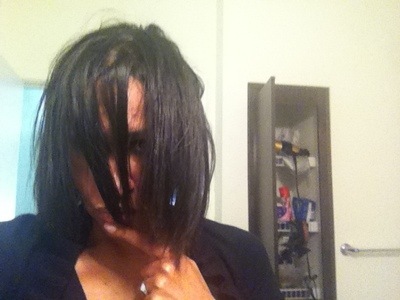 I have also noticed that the ends of my hair are not breaking off as bad as they did previously with air dry styles. I think it’s because I have clipped some of the troublesome ones off and am doing a better job of keeping my hair M&S with quality products. Here are the pics from Friday’s twist out! This past Saturday was Wash Day (and dusting day … the ends needed it!). 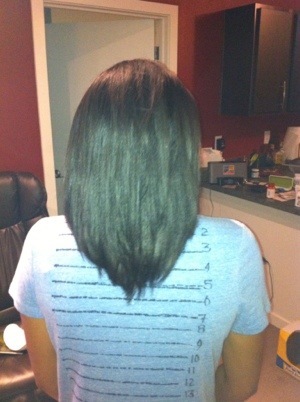 I did the first part at home and then went to Ulta and got it flat ironed. I started off with a pre-poo that consisted of VO-5, Queen Helene hair placenta, grapeseed oil and vegetable glycerin. I left it in for about 2 hours. I must say that I really like the results from pre-pooing. I feel my hair is more shiny when I finish! I washed as normal, but I could still smell the sulfur mix in my hair. I washed again and thought it was gone … boy was I wrong. I could smell it when I blow dried my hair! Next week will definitely be a clarifying poo week! I steamed with my Alterna 10 hair masque, which I am still loving. It has been about 3.5 months since I have started using it and I think it works well with my hair. I followed that up with my normal leave-ins, focusing on making my hair heat-ready by adding a bit more heat protectant. I blow dried my hair (which I hate doing now), tied it up, then went on to Ulta. Sarah was not there because she had food poisoning! 😦 Two other ladies flat ironed my hair and while it was ok, it was no Sarah job. I think that they did not even flat iron the ends, as there was no bend in my hair. It literally was stick straight, so I wrapped it up and it turned out OK. 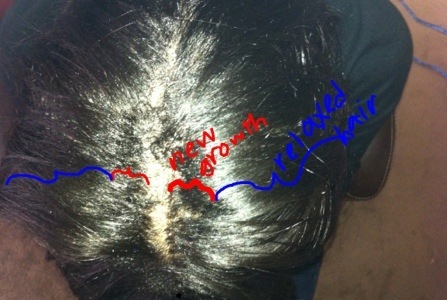 I had Nathan measure and take a picture of my new growth. There is about an inch in the back of my hair (and it is pretty thick) and maybe half an inch in the front. By the time I get it relaxed in 8 weeks, I am pretty positive the longest length will be at the 7 on the length check shirt (I have a few scraggly ends that have grown past the 6). 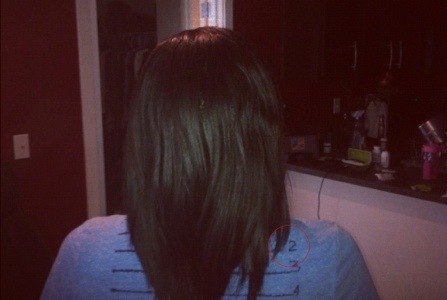 My hair grows in a V, so I want the bulk of the hair to at least hit the 6 (that would make me very happy! – seriously … very happy)! For the past four months, I have been using NJoy’s sulfur mix. I have had OK growth with it, but nothing mind-blowing. Another thing is that the sulfur smells horrible. It is kind of embarrassing when I am at the gym and the sweat and the sulfur starts mingling. To top it off, I use the machine closest to the fan, so it just blows on it. I hope others do not notice it! I have been inspired by old challenges on Hairlista, in which Sunshyne uses Jamaican Black Castor Oil (JBCO) and sees pretty good results. I am going to try a 2 month challenge using only JBCO and a carrier oil, as JBCO is very thick. I will be using it just like I do the sulfur-mix, which is 2 to 3 times a week. I took some baseline pictures. My ultimate goal is to grow out my front, as it is the slowest growing part of my hair. I will take pictures after I relax in mid-August to see how I did! In my case, my sides are at the 3 on my length check shirt, meaning I have two inches to go before I reach “FULL APL,” but by then, I will closer to BSL. Sigh … I don’t know how I can speed up the growth on the sides, I guess continuing with the sulfur and castor oil massages. This is often an issue with other bloggers too! The sides are just slow-growing! I wanted to make Full APL by August, but that is not going to happen. I hope by November I will be able to claim that!! This past Sunday was Wash Day. It was pretty good! I did a pre-poo of Queen Helene Placenta oil (it was on sale for $2 at Sally’s), cheapie conditioner and honey (for its humectant properties). I think it was a good blend of protein and moisture (most cheapie conditioners have protein in the them). I washed as normal and did my Alterna 10 steam treatment. I wanted to airdry, as rolling my hair can get tedious, but I decided to roll it anyway. For some reason, I was very antsy this past Sunday and did not want to sit under the dryer for an hour and 15 minutes. I watched an episode of “Locked Up Abroad” on my iPad (I love that show! ), but still that wasn’t enough to distract me from the boredom. I was a bit worried that my curls would come out frizzy (see the first or second blog post when I did not let my hair completely dry), but they ended up turning out very nice. I threw some Vitamin E oil on it and let it go. I have been wearing my hair in protective styles 100% the past week, and plan to do so this week. I have come to love the Southern tease bun, which essentially one half of your hair is pinned back and the remaining hanging part is tucked up into a bun. It is easy, it is cute. Since I am protective styling 100%, I think that I may start braiding my hair after conditioning and letting it air dry. I may try that in a few weeks, as this week I am getting my hair flat ironed this weekend.